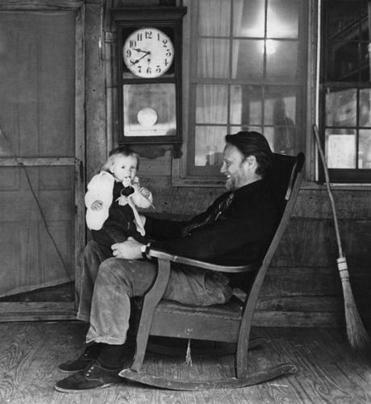 Mr. Ehle with his daughter Jennifer on the porch of their home in Mitchell County, N.C., in 1971. NEW YORK — John Ehle, whose historical novels set in the Appalachian Mountains were acclaimed for the authenticity of the characters’ lives, died on March 24 at his home in Winston-Salem, N.C. He was 92. Mr. Ehle, who had been married to the British actress Rosemary Harris since 1967, wrote radio dramas, biographies, a nonfiction account of student civil rights protests at the University of North Carolina, Chapel Hill, where he taught, a history of the Cherokee Nation, and a guide to French and British wines and cheeses. But he is best known for his seven Appalachian novels, which were partly inspired by stories he heard from his mother’s family, whose roots in the mountains went back several generations. Mr. Ehle’s cycle began with “The Land Breakers” (1964), which takes place in the late 18th century, and ended with “Last One Home” (1984), which brought his characters into the Great Depression. Critics praised the epic sweep of his stories, their vivid detail, realistic dialogue, and the dignity with which he invested mountain people who have often been stereotyped as hillbillies. Mr. Ehle’s books were usually well-reviewed and earned him a place in the canon of Appalachian literature. But he did not find a vast readership in the United States. One fan, though, was Harper Lee, who lauded “The Land Breakers” when it was republished in 2006 by Press 53, a small Winston-Salem publisher. “John Ehle’s meld of historical fact with ineluctable plot-weaving makes ‘The Land Breakers’ an exciting sample of masterful storytelling,” Lee wrote. The next book in his Appalachian cycle was “The Road” (1967), a Reconstruction-era novel about Weatherby Wright, a white mountaineer who uses inventive engineering methods and convict labor to build a railroad from the lowlands to an isolated mountain region near Asheville, North Carolina.